Yesterday we covered how the lawsuits between Apple and Samsung may have fueled sales for the new Galaxy Tab in Australia. Now, it looks like Samsung is putting money where their mouth is and making it a marketing campaign. The ad appeared on a page from the Australian’s Sun Herald but we’re unsure if it was placed anywhere else. The pitch might have been the cause of high demand for the tablet. 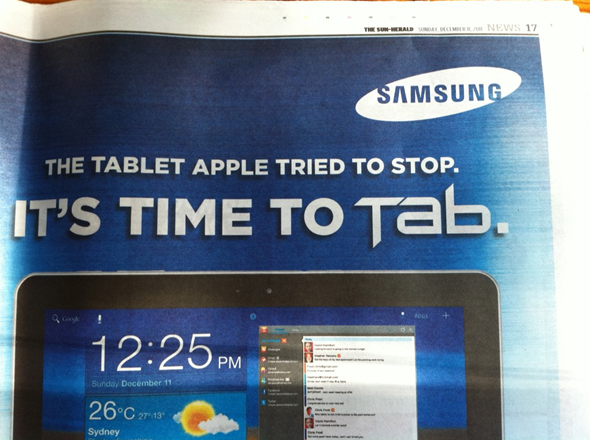 According to Samsung, they are struggling to manufacture enough of the tablets to meet the preorders. 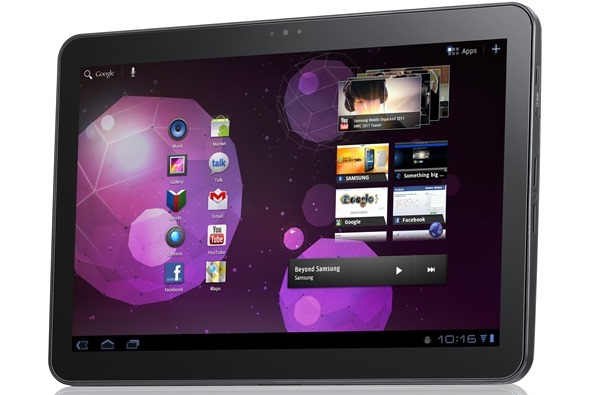 It is uncertain how much money Samsung has lost in sales due to the delay of the Galaxy Tab tablet. The gadget was due out this past summer but after a few court victories, Apple managed to ban the device from sale –that is until now. The courts have recently rejected Apple’s appeal to continue the ban further giving way to Samsung to market and sell their device in Australia however they wish. If the headlines between Samsung and Apple in Australia are making buzz worldwide, it is no surprise the marketing waves are bigger and louder in within Australian borders. According to McGee, Apple made the tablet a “household name” by taking Samsung to court for “slavishly copying” the iPad. As always, remember to take all predictions with a grain of salt. Free marketing does not always equate to sales. Consumers simply have an additional choice when purchasing a tablet. Many factors are considered when choosing any type of gadget ranging from price, usefulness and brand recognition. It will be interesting to see Samsung’s sales figures for the device. The holiday season is right around the corner and we would love to see all tablets out there to sell in harmony. Why not put the hate aside for once right?